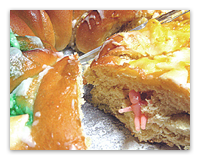 Originally, King Cakes were a simple ring of dough with a small amount of decoration. Today's King Cakes are much more festive. After the rich Danish dough is braided and baked, the “baby” is inserted. The top of the ring or oval cake is then covered with delicious sugar toppings in the traditional Mardi Gras colors of purple, green and gold. Ordering King Cakes over the internet has now become an annual tradition by consumers all around the world - and many of our bakers offer them year round. After all, you can’t have a Mardi Gras party without a King Cake!